In other words, democratic centralism allows the expression of ideas to a certain point and after the ‘vanguard’ party had reached a decision, all party members including the society have the obligation to abide by those decisions. After a policy or decision is made by the top leadership of the party, all the people living in that country, let alone members of the party, have the duty to abide by it. The public has no any role in contributing its views on the subject since the vanguard party is assumed to act always in the interests of the masses. By its nature, democratic centralism is contrary to the ideals of democratic governance. While democracy requires leaders to abide by the decision or interest of the public, democratic centralism requires the public to abide by the policy forwarded by the top elite who claim to know what is best for the society. In democratic centralism, if any member of the party attempts to challenge the decision, it will amount to factionalism and serious measures will be taken against dissenters. The importation of the system of democratic centralism to the Ethiopian political sphere is closely linked with the radicalization of the students’ movement in the 1970s. As a product of the leftist political movement in Ethiopia, TPLF inherited and extensively used the organizational principle of democratic centralism and Maoist conceptions of mass political mobilization during the armed struggle. Consistent with the Leninist conception, the democratic centralism used by TPLF allows party members to have the right and obligation to discuss the agendas presented freely, to oppose, support and provide critical comments. At the end of any TPLF meeting, democratic centralism requires the majority decision to be accepted by the minority. After a decision is made, members have no right to mobilize others against decisions passed by the party. By demanding absolute loyalty, democratic centralism has enabled few individuals to have absolute power and dominance while the ordinary members are left only to follow orders and preventing them from asking question or correcting the mistakes of the organization. After it controlled political power, democratic centralism has proved to be an efficient mechanism that has helped TPLF to control its members to the lowest level. Since the party has structures extended to the lower kebele administration, democratic centralism has enabled the party to extend its control over all aspects of life in the country. The regional and kebele administrations are controlled by cadres of TPLF rather than being representatives of the community. Compared to the opposition parties that have poor organizational structures, democratic centralism has enabled TPLF to use its party channels as instruments of policy execution as well as extending repression to the grassroots level. Democratic centralism has also been instrumental in crushing political opponents. The system was effectively used to dismiss powerful party leaders from TPLF in 2001. Though the root cause of the split within TPLF was largely on policy difference in the leadership, the difference was finally settled through the aggressive use of the system of democratic centralism. 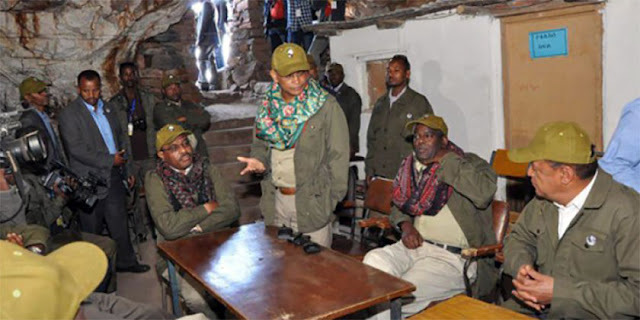 Veteran members of TPLF were dismissed from the party after being accused of violating the democratic centralism principle of the party. The dissenters were labelled as factionalists and dismissed from the party since the party’s internal rule provides that those who do not accept the majority decision should be excluded. Though the application of democratic centralism has enabled TPLF to be efficient in terms of ensuring discipline within the party structure, the wider application of the system has brought serious implications to the democratization process in the country. Apart from being used to maintain discipline within the party, democratic centralism is one of the major principles currently regulating government structure and intergovernmental relations. The principle is also responsible for undermining the separation of powers principle and the significance of official channels of government. In order to exercise checks and balances in a democratic system of government, there has to be a reasonable distance between the various organs of government. Though there are legislative, executive and judicial organs in the Ethiopian constitutional system, the separation of powers principle has been undermined due to the extensive application of the party’s policy of democratic centralism. Since members of the parliament representing TPLF/EPRDF are tied to democratic centralism, there is no any effective way the parliament could control the executive branch. Any opposition to the party’s policies may entail serious consequences since it is considered as factionalism. In a parliament wholly controlled by TPLF, virtually every decision is made by the regime and largely enforced by tightly controlled party and government apparatus through the system of democratic centralism. The aggressive use of democratic centralism has also blurred the separation of government and party structure. The system has seriously undermined the clear distinction between party and government apparatus in the country especially in lower administrations. As far as a government official is loyal to party policies, the authority of the public or legal institutions in controlling the corruption of party loyalists is very limited. Legal or disciplinary measures will only be taken against the corrupted party loyalists when the central organ of the party gives the green light to that effect. Democratic centralism has also undermined the application of the constitutional principles of accountability and transparency. In a system that is firmly controlled by the system of democratic centralism, government business is discussed and decisions are made at party meetings that precede meetings of state bodies. In such systems, a few political party leaders make major decisions while the passing of decisions in government institutions is being a formality. The decision-making process of the system is largely secretive and restricted to few members of the politburo or the executive committee. The application of democratic centralism across the system has also seriously undermined the authority of the regional governments. Despite the fact that the constitution provides numerous powers to regional governments, they are largely expected to act in accordance with the party position whether a policy is relevant to the region or not. Regional governments are largely expected to endorse central government policies due to their obligation to abide by the party rules. Due to the existence of strong democratic centralism mechanisms, regional authorities are keener to keep their party connections rather than to be accountable to regional institutions or the public. The political fate of the regional authorities is largely determined by the party organ at the center rather than regional government or party apparatus. In the last three years, the entrenched repressive democratic centralism system used by TPLF to preserve its hegemonic power has resulted in widespread protest and conflicts in the country. The Ethiopian people have clearly expressed their detestation of the injustices committed by TPLF and the restricted political space in the country. It has become clear that the democratic centralism system that has been used by TPLF to control the people under its iron fist for the last twenty-six years has reached to its limit. Though there is no any indication that TPLF is abandoning its system of democratic centralism, it has realized that the status-quo cannot maintained and change is inevitable. But unless TPLF’s system of democratic centralism is completely annihilated, a genuine democratization process will never take roots in the country. Source Used - Semahagn Gahsu Abebe, The Last Post-Cold War Socialist Federation: Ethnicity, Ideology and Democracy in Ethiopia, Routledge, 2014.